Two families. United in grief but also anger about the treatment of victims in the criminal justice system. 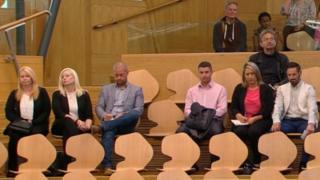 Sitting, silently, side by side in the public gallery at Holyrood. Nicola Sturgeon's immediate challenge was to answer the points about victims' rights raised by Ruth Davidson, the Conservative leader. But, of course, she was also keenly aware that her every word, her every gesture, were under scrutiny from those directly involved in the issue. After witnessing the exchanges inside the chamber, I headed outside to speak to the families. The twin daughters of Mike Mosey, a former police officer. Murdered in his Lanarkshire home twelve years ago. They had been led to understand their father's killer would not get early release. Then last month, on the anniversary of their father's death, they received a letter informing them that release had been sanctioned. They are upset, bewildered, angry. They feel let down by the system. Then, beside them, the family of Michelle Stewart, murdered ten years ago by an ex-boyfriend when she was just 17. Visibly shaking, her father Kenny tells me of his despair at learning that her killer has been on temporary release from prison, in preparation for the eventual end of his sentence. The family fear meeting him by chance. They say the system is stacked in favour of the criminals. The issue was particularly pertinent today, in questions to the first minister. That is because Ms Sturgeon, in her programme for government statement on Tuesday, announced a "major package of reforms that will better protect victims in the criminal justice system." Ruth Davidson wanted details - and a timetable. She said victims' families were fed up with "warm words". Probably it was the sensitivity of the topic, perhaps it was the presence of families, but the exchanges were mostly moderate and modest. They covered such ideas as greater transparency in the parole system, the ability for victims' families to participate in that system, new rules (described as Michelle's Law) excluding released criminals from the home area of victims' families. Nicola Sturgeon insisted that all this and more would feature in her government's review. And she stressed that victims of crime and their families would be given a say, would be consulted. The families watching from the gallery will expect that, as a minimum.